If marketers want to know whether marketing to children works or not, they need just ask the countless parents who found themselves spending extra at Pick n Pay last year to ensure they scooped Stikeez. I know because I was one of them. My two kids, like thousands of other children around South Africa, were smitten, and that meant I was spending the odd R20 or R30 extra here and there to make sure I had at least two Stikeez – one for each child. The Stikeez campaign was extremely clever, and, if you’ll excuse the pun, sticky. It’s had results too. The latest Sunday Times “Generation Next Study”, based on HDI Youth Marketeers’ research, shows that Pick n Pay has overtaken Woolworths as the “coolest grocery store” in the youth market. And “A Youth Lost in Translation”, a white paper recently published by Yellowwood, points out that while Pick n Pay was unable to put a figure to the success of the campaign, their corporate consultant, Jennifer Crocker, says that the popularity of Stikeez exceeded even Pick n Pay’s expectations. The campaign gained traction quickly, but I think Pick n Pay was smart in not letting it drag on too long. If they had let the campaign run on for a longer period, they would have risked kids getting bored of the Stikeez, parents resenting Pick n Pay, or Stikeez losing their exclusivity and thus their appeal. The other thing that was really clever was that Pick n Pay tied the Stikeez campaign into its other marketing campaigns, like Brand Match and their in-store promotions. Customers could get extra Stikeez by buying participating products. And so we did. Even if we didn’t need the participating products! It was a campaign that really influenced buying behaviour. “A Youth Lost in Translation” notes that this “pester power” is not a new phenomenon. In fact, Yellowwood points out that the term was coined as long ago as the 1970s. Obviously, children will be exposed to advertising, whether it’s via billboards, magazines, TV, the internet, or in-app adverts on their mobile games. But that’s different to marketing directly to children as a target audience. Where marketers are doing the latter, they need to tread carefully and consider the consequences of their campaigns. For example, I believe it’s irresponsible to use tactics that will make children feel inferior for not getting a particular product, particularly in South Africa where the levels of inequality are so high. We can’t make children feel “not enough” because they don’t have a product. 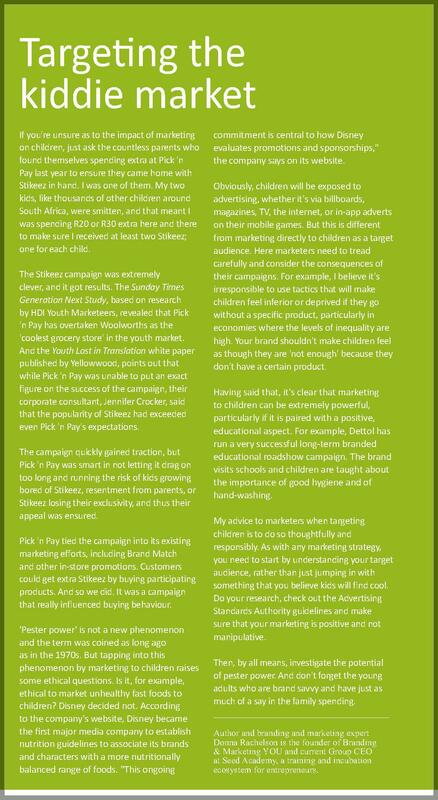 That said, I do think that marketing to children has a role to play, particularly if it is paired with a positive, educational aspect. For example, Dettol has run a very successful long-term branded educational roadshow campaign. Schools are visited and children are taught about the important of good hygiene and the importance of hand-washing in stopping germs from spreading. So, my advice to marketers looking to target children would be to do so thoughtfully and responsibly. Like any marketing strategy, you need to start by understanding your target audience, rather than just jumping the gun with something that you think kids will find cool. Do your research, check out the Advertising Standards Authority guidelines and make sure that your marketing is positive and not manipulative. Then, by all means, investigate the potential of pester power. And don’t forget the young adults, who are brand savvy and have just as much of a say in the family spend.